The Neuroscience of Cocaine: Mechanisms and Treatment explores the complex effects of this drug, addressing the neurobiology behind cocaine use and the psychosocial and behavioral factors that impact cocaine use and abuse. 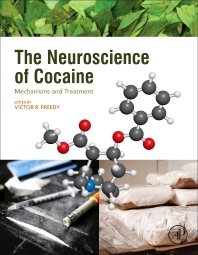 This book provides researchers with an up-to-date understanding of the mechanisms behind cocaine use, and aids them in deriving new pharmacological compounds and therapeutic regimens to treat dependency and withdrawal symptoms. Cocaine is one of the most highly abused illicit drugs worldwide and is frequently associated with other forms of drug addiction and misuse, but researchers are still struggling to understand cocaine’s neuropharmacological profile and the mechanisms of its effects and manifestations at the cognitive level. Cessation of cocaine use can lead to numerous adverse withdrawal conditions, from the cellular and molecular level to the behavioral level of the individual user. Written by worldwide experts in cocaine addiction, this book assists neuroscientists and other addiction researchers in unraveling the many complex facets of cocaine use and abuse.